A family run Certificated Location set in and with commanding views of the beautiful Warwickshire countryside with easy access from the main A46 (Warwick/Stratford Road) and striking distance of Stratford Upon Avon. 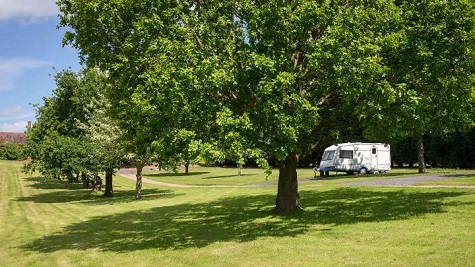 We accept touring caravans and motorhomes all year round on our five all-weather hard standing pitches. 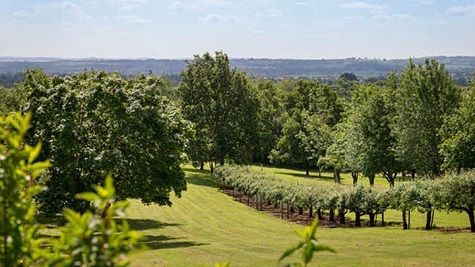 The site comprises 4 acres of gently sloping, mown, parkland sandwiched between two orchards and scattered with a mixture of mature trees and set behind robust hedges offering high levels of privacy and security in equal measures. There is an abundance of fruit trees in and around the pitching area. 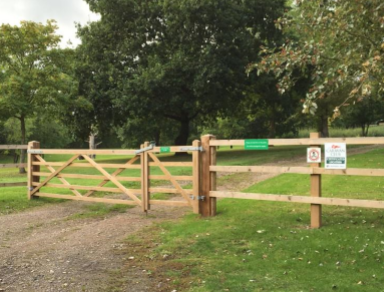 Hollow Meadow is set within electrically operated night security gates and visitors will be supplied with the security code prior to arrival. The village of Snitterfield, with general store and "The Snitterfield Arms" serving excellent food is within 1 mile of the site. From here there is a bus service with connections to the tourist hub of Stratford Upon Avon. Alternatively, Stratford Upon Avon park-and-ride is less than two miles away with Warwick, Kenilworth Castles and the spa town of Leamington also within easy travelling distance. Our CL is also ideally situated for those wanting to visit the NEC. 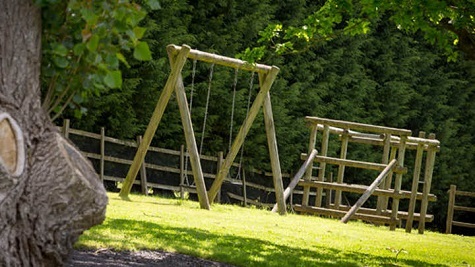 The area is well provided with National Trust properties and events plus numerous walks and cycle rides including the Monarchs' Way which runs by the side of the Farm Shop. The fishing lakes share the same access drive as the CL site, www.ardenlakes.co.uk. Ignon Manor Golf Course is within walking distance with its dedicated "‘No 19" restaurant which does a Sunday carvery. Within a few miles there are two other golf courses whilst a little further afield there is horseriding, wakeboarding, gliding and other activities. One thing for sure there will be more than anough to entertain you during your stay or alternatively you can just relax and unwind in the tranquillity that is Hollow Meadow CL. Pitch prices are £15 per night. You can check availability and book online on the dedicated CL page of our Website and call or email to make a reservation. You can also look at our Facebook page for all the latest news. 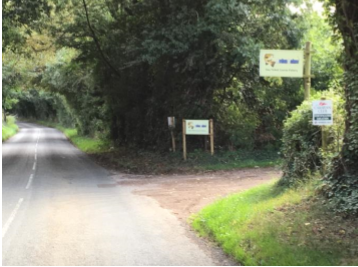 Should you have non-caravanning family and/or friends who would like to join you for a Warwickshire break we have three 5 star rated Holiday-Let cottages see the new Prestige Cottages website. 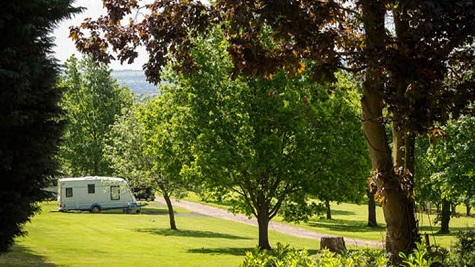 Facilities : Electric hook up available, Easy access, Suitable for Caravans and Motorhomes, Hardstanding pitches, Scenic views, Shower, Dogs allowed, TV reception good, Self catering Cottages. Nearby : Golf, Fishing, Restaurant/Pub, Public transport. We used this site as a stop over on our route home. What a lovely site. We understand we arrived out of season so apart from one other the site was empty. 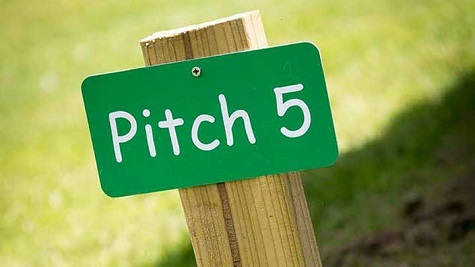 We took pitch number 3 which was perfectly level and ideal for our Motorhome. Water point right next to us and ehh to the rear. We are wild camping folk so this was a extravaganza for us. We read some of the reviews and yes some are right, but we loved the place and will return. Short weekend away not far from home. Lovely spot. Minor road noise from nearby A46 but not an issue. As others have said, it's tight to get a caravan onto the pitches without driving on the grass, about which there are stern signs! Pitches do slope sideways. Obvious place to park your car gives a view of your car from the front caravan window rather than the lovely orchard behind it. Raised waste disposal drain not easy with a heavy grey waste tank. Nice local village with good shop. Didn't try the local pub. Good walk over fields to pub at Claverdon and back, about 9 miles. Would go again. We were due to stay at Hollow Meadow when the heavy snow came and couldn't get there. Instead of saying hard luck the owners of Hollow Meadow offered the opportunity to re-book at a time of our choosing which we did. We felt that couldn't have been more amenable. When we stayed it was nice and quite. Turning into the hard standing and avoiding the grass was tight but doable, but our motorhome is a short one. We didn't see the owners at all, but all the details for arrival were very clear and so it wasn't a problem. We cycled in to Stratford, about 2.5 miles. Found the site easy with directions from owner. The problem we had was getting on pitch very tight signs up saying fines for driving on grass. We don't have moved so took ages. The rain didn't help.Pitches 1 &2 not suitable for awning. Nice views of orchard quiet site, good location.Also bus at bottom of drive. Very good and friendly information from owners about walk in area ect. Wet - but not washed out! We’ve just spent what must be the wettest Easter on record at this lovely site. The positioning of the hard standing pitches mean you are well above the base of the field. Getting on and off the site was not a problem and our unit remained fairly mud free. I’d imagine people on less well drained sites have struggled this weekend. We were on pitch 1 which is fine, except very tight for an awning, ours is small as is our van but we did find it very tight. However, that is the only very minor flaw in what is an exceptionally well maintained and well situated CL. Stratford is easily accessible, either by car or the nearby park and ride. Mary Arden’s Farm is very close as is Anne Hathaway’s cottage. Warwick and Leamington Spa are within a 15 minute drive. The village of Snitterfield is a short walk away, the shop is well stocked and the Snitterfield Arms is great for food and drink. Our arrival was fast, smooth and easily achieved with a motor mover. The owner was lovely, available if necessary leaving all caravanners in the perfect peace and tranquility that the site offers. I’d love to return in warmer weather, the fruit trees will be wonderful in a few weeks time when full of bloom. Definitely one to revisit! Directions : How to find us from A46 heading West towards Redditch, Evesham and Worcester. Take signed exit from roundabout saying Snitterfield/Park & Ride, Aprox 1.1 miles turn right signed Snitterfield / Norton Lindsey. Follow road around to the left onto King's Lane. Follow road over the A46 bridge, keeping left. The road becomes Ingon Lane at this point. Follow road downhill signed Stratford, from this sign 0.2 miles turn right signed Arden Lakes. Look out for the Arden Lakes and CL Site signs. How to find us from A46 heading East towards M40, Warwick & Birmingham. From the Stratford Park & Ride roundabout take the exit signed M40, Warwick / Banbury/Birmingham. Go up hill and after 2.5 miles turn left signed Snitterfield / Norton Lindsey on to Kings Lane. Follow Kings Lane around to left, over the A46 bridge. The road becomes Ingon Lane at this point. Follow Ingon Lane down a hill signed Stratford. From this sign 0.2 miles turn right signed Arden Lakes. Look out for the Arden Lakes and CL signs on your right hand side.